I began my process with dumping all of my immediate thoughts onto paper as well as gathering reference images that inspired me. I instantly gravitated towards heavy architectural influences, and the concept of optical illusions. A lot of my inspiration was pulled from the works of MC Esher and the popular indie video game Monument Valley. 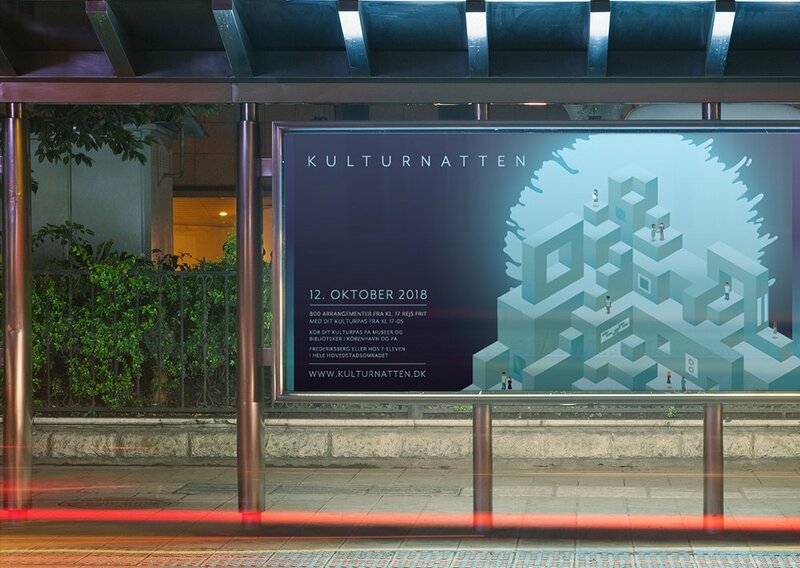 Kulturnatten represents the conglomeration of all forms of the arts on one night from one side of the spectrum to the other. I wanted to represent the journey one might experience through these different worlds on the night of the event. As I have written down on this sketch I wanted to portray those different worlds and how they are connected by “abstract pathways.” This phrase stuck with me throughout the entire design process, as the poster needed to represent the night as a whole and I felt that that phrase presented an opportunity to capture it. For my mood board I pinned up images that contained that heavy architectural influence that appeared in my process notes. Studying abroad and learning about Danish design was one of my biggest inspirations on this project. We traveled weekly to local design studios to learn and understand the roots of Danish design. Since I lived in the heart of Copenhagen, I was surrounded by historical architecture combined with the sleek modern interiors of danish home and furniture design. Design in the Scandinavian world is upheld to a standard unlike I have ever seen, and I was greatly influenced by my experiences, not only during my time living and studying in Copenhagen, but something I hold near and dear to me until this day. The top portion of this mood board is images of inspiration I found online. The bottom half of the mood board is collected images from my travels in Scandinavian that inspired this project. Images are pulled from the cities I walked, museums I explored, and design studios that I was filled with knowledge by. After I had plotted out my ideas I came to a crucial impasse, before me I had two well thought out design directions that I could travel. One, a day and night version of an architectural structure, and the other a moonlit museum. Both posters possessed unique qualities about them, but I ultimately decided that the moonlit structure better fit the overall theme of Kulturnatten and captured the midnight art stroll throughout the city. To the right are some of my early digital sketches and poster drafts. For the final poster the design captured the moonlit glow that is cast over Copenhagen on the night of Kulturnatten as all the participants wander the city. The main graphic creates an abstract reality that guides viewers eye throughout the event. Kulturnatten represents all forms of art and I wanted to show how these different forms can come together on an evening with no seeming correlation to one another. The poster was intended to function as a solo piece of art rather than blatant marketing material. For that reason the text was kept very minimal, the title text is non invasive to the main design, and allows the graphic to function as the focal point. 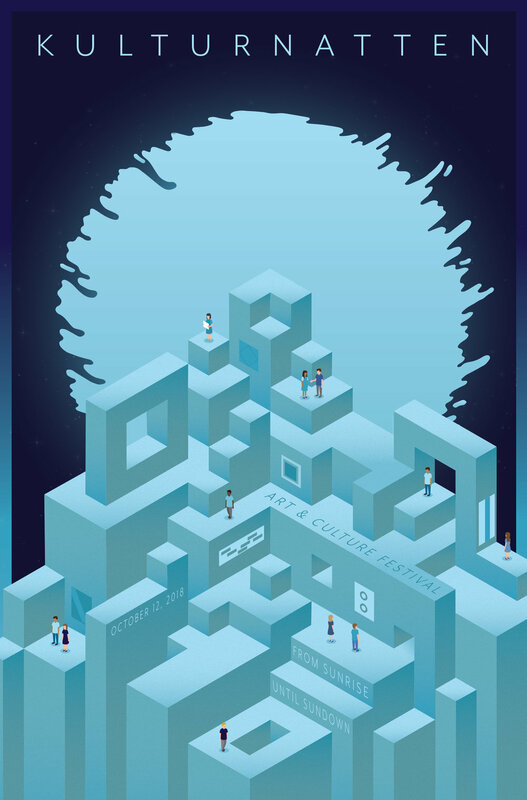 The sub text “Art & Culture Festival” as well as the date and times, was incorporated into the isometric grid to merge with the graphic rather than stand alone and detract the viewers eye. Featured on the main graphic are optical pathways and tunnels, participants wander these trails as they gaze upon art and explore. 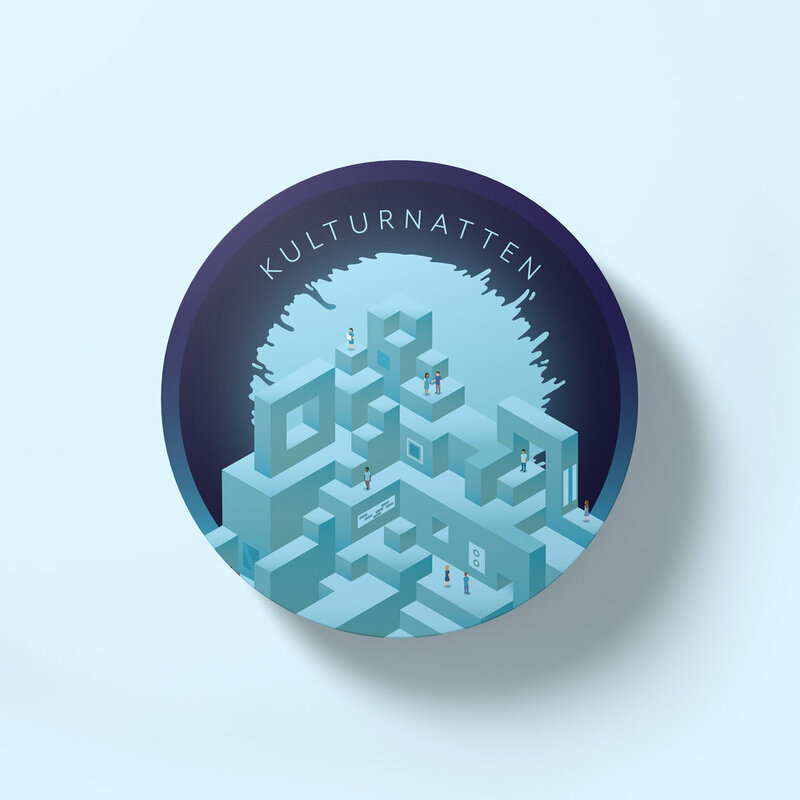 For the event of Kulturnatten a one time purchase of a button pass is the ticket to all of the activities. We were asked to design a large button for the adult pass and a smaller version for the children. I decided to include three options for the kids to choose from, adding a fun interactive element for the kids to increase their excitement. The buttons featured some of my favorite intricacies from the main event poster. I chose certain portions of the poster that had a lot of visual interest, that also had participants wandering. The text on the adult badge features the date as well as additional information about transportation (in Danish), the smaller contains the title and text “Børnepas” which means children’s. For the design of the event programme I followed the main poster design. Since it was a smaller deliverable and I didn’t want any of the detail to be lost by placing the entire poster on the cover. Because of this I chose a more zoomed in portion of the poster to highlight the details present in it. The text on the isometric grid was switched to contain just the date and “Programme” as well as the main title at the very bottom. Because the main graphic has a lot going on the text was kept simple to prevent things from overwhelming the viewer. With train being one of the main forms of transportation within Denmark, having a railway poster was a key element of the deliverables. Since the poster functions as an art piece rather than a typical advertisement, the average train goers eye is immediately caught by this sign. The sign contains the main graphic, date and title, as well as featuring more details about ticket purchases and website information in the bottom left corner. We were given the freedom to create a final deliverable of our own. I chose to create stickers to be handed out for the event. I had multiple reasons behind choosing stickers: one was that they are currently a large trend and tend to be placed on personal items such as water bottles and laptops etc. Not only does this make them a crowd pleaser but it also doubles as additional marketing.